Moravia, northern Austria and southern Poland, about 29,000 – 25,000 years ago. he era of the great European cultures of the Northern-type hunters. The Pavlovian is a noteworthy variant of the Gravettian culture. Its centre was located in Moravia, and the culture reached northern Austria and southern Poland. Its name is derived from Pavlov, a village on a slope of the Pavlov Hills, next to Dolní Věstonice in southern Moravia. Another important Pavlovian site is Předmostí, now a part of the town of Přerov. Middle European Gravettian era Pavlovian and the later Middle European era Willendorf Kostěnkien have a lot of in common. The most significant mark was the importance of the mamooths, which overreached the importance of the common hunted animals. A large part of the water came from the Northern glacial, therefore was the European coast of different shape. The circles indicate the Pavlovian and Willendorf Kostěnkien archaeological localities. Many documented innovations in technology. Formation of relatively large and permanent settlements. Stable economy, sufficient food supply and prosperous society. Importance of mammoths and, on the other hand, of small animals such as hares. Greater tendency to inhumation of the dead. The world-renowned archaeological discoveries began at the end of the nineteenth century. The Pavlovian sites provided the world’s largest number of skeletons of modern humans from the Palaeolithic era. The Pavlovian culture is remarkable for a lot of inventories and a wide range of diverse technologies. Some of them, such as the production of ceramic figurines in kilns, the fibre-based technology, grinding of plant food and others, were documented in the Pavlovian sites for the first time in the past of modern Homo sapiens. The number and the variety of unearthed items are also remarkable. 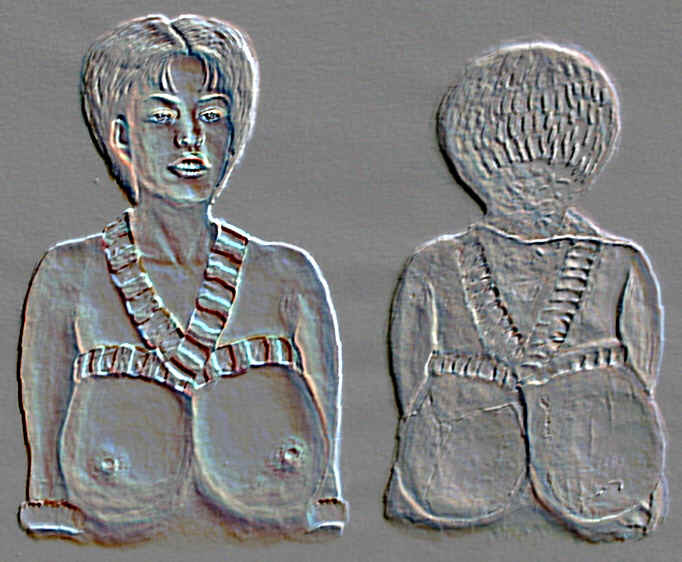 For example, the ceramic Venus of Věstonice has a worldwide reputation, but in fact, she was not the only ceramic Venus unearthed in the surroundings of Dolní Věstonice. She was only the best preserved. There have been found fragments of other Venuses, made by the same technology, looking similar to the Venus of Věstonice. The Venuses were probably produced in series, which may indicate more extensive usage of these figurines. Besides these ceramic Venuses, there were also dug up several carved artefacts depicting, often in an abstract form, typical women’s shapes. 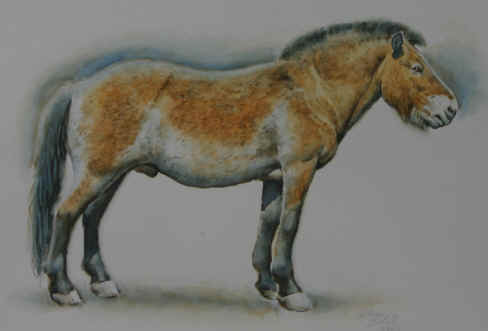 The best known Moravian Venuses can be considered a form of the geometrised art. 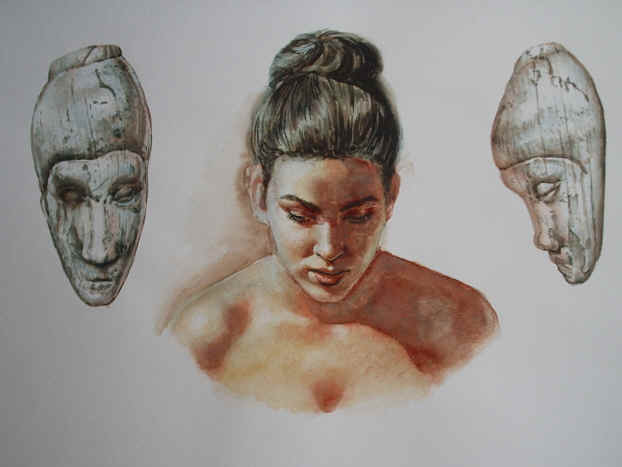 Nevertheless, the depictive art is also present, for example, the ivory female head from Dolní Věstonice. M. M. Gerasimov created the model of the woman’s head from Dolní Věstonice according to the skeletal material already in 1970s. The white colour of gypsum or the colour of the metal surface of the model made it too academic, unable to appeal to the general public. The work was exhibited in Prague in late 1970s. The public was embarrassed because, as the magazine Pionýr wrote, the woman looked too modern. The editor apparently expected to see a dishevelled woman with a low forehead and a receding chin as these people had been depicted in outdated books (e.g. in The Mammoth Hunters by Eduard Štorch). The picture is just an improvement of the original work and can be considered a praise for Gerasimov. The original work was excellent from both the professional and sculptural point of view. 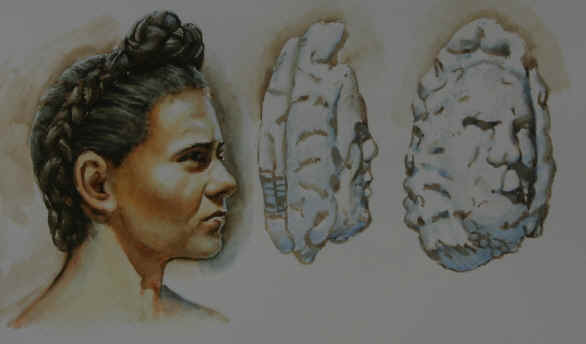 In 2000, a lot of portraits of the Paleolithic people were made according to the original skulls for Antropark. Sadly, the grant committee didn´t consider this work for important and none of them were converted into the form of an image. As an illustration, this painting was created - it shows five of the working portraits. The blue one on the left is a portrait of a contemporary man, on the right is a portrait of an individual of Kostěnky and the three faces in the middle represent the only complexly elaborated material, showing the faces of the prehistoric people found in 1895 in a mass grave in Předmostí u Přerova. The reconstruction represents a person of Moravian Gravettian, wearing a hat. The attention paid to the head is typical for the Gravettian period (Brno II, Předmostí). Permanent winter habitation of the Pavlovian people had to meet many requirements. There had to be a good view of the landscape from the site, but it did not have to be situated on the top of a hill and not facing south (to avoid melting snow by the sun rays during the day and freezing the snow and water during the night). There had to be a river nearby, and the sea level of such a site had to be in certain limits. Winter dwellings were permanent, their basements and walls were probably made of stones and mammoth bones, sometimes joined by moulded soil. Roofs were made of wood and isolated with turf and maybe also reed, which was available in the arctic conditions. The unique locality on the North Moravia brought a fascinating finding about heating. On the picture, we can see a woman working with the lumps of minerals crushing them to a fine coloured powder. The place on the underlay stayed so intensively pigmented, that even the archaeologists making the research could still see it. In the basket by the entrance is a hoard of black coal, which the prehistoric people gathered in the surface outcrop of the coal layer. This is the oldest archaeologically exemplified evidence of the usage of the black coal. In Dolní Věstonice, human used long and large mooth bones rich in fat for heating. 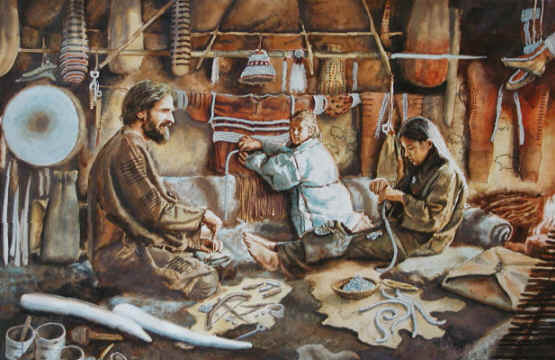 The image shows a family during common working process. 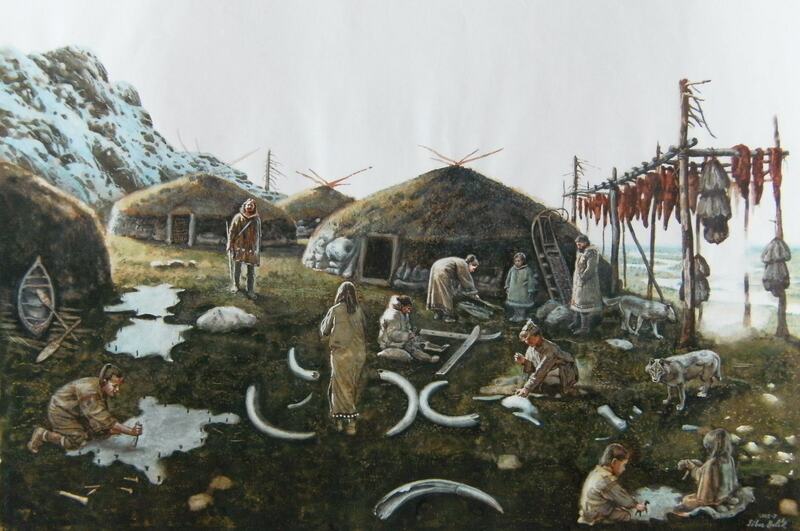 The older reconstructional imitation of a temporary Pavlovian habitation shows leather-covered tents and a typical deposit of mammoth bones. However, such material as leather is suitable only for summer mobile tents. On the other hand, permanent dwellings were insulated properly. For example, the basements of the walls made of bones found in some sites of eastern Europe are one metre thick. This testifies to the thickness of the insulation of the permanent winter dwellings. 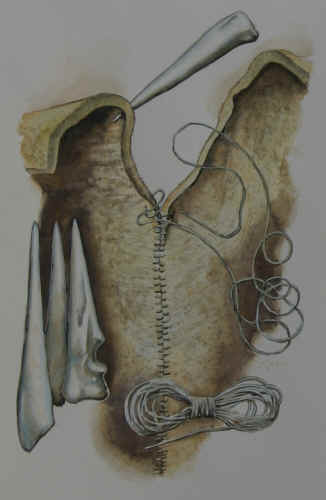 An older image illustrates the technique of sewing the fell together, with the help of stitching awl and long tendons, similar to a fishing- line. In the background, we can see another transferable exemplar of dwelling for temporary summer settlement. 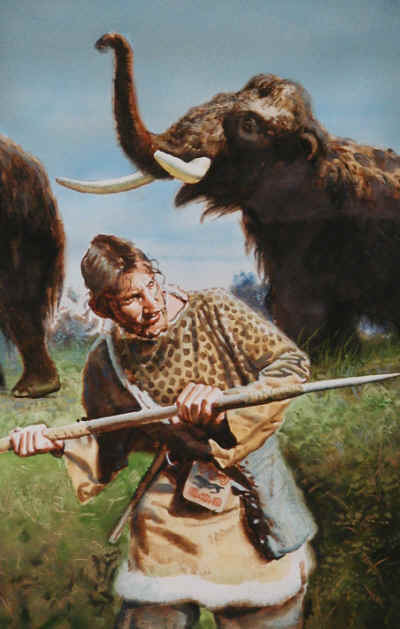 One of the most powerful weapons of the hunters and trackers were spears and arrows with microlithic points (small blades and even tiny saws). Hunting of small animals in tundra. Each hunter had to be above all an excellent tracker, who could read in the landscape, was able to find the recent tracks of an animal and approach it as near as possible. The hunter on the picture is about to shoot on the Willow Ptarmigan. The specialist found traces of the projectile points on the bones of the hunted animals. The hunter shot an arrow, which pierced the animal’s body. The animal was either killed on the spot or, if not, when moving, the saw of the point made its injury fatal. What remained was to track the animal. A bow was ideal for individual hunting. 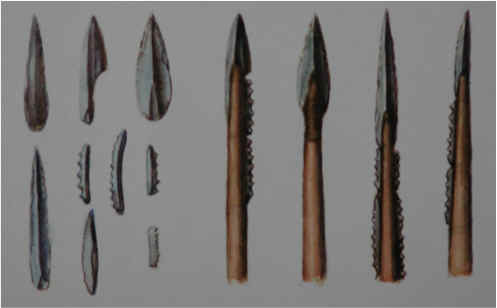 Silicic microliths and other small segments of the Moravian Gravettian were put together in different combinations to show a wide variety of the composed weapons heads. The hunters also used different traps to hunt small animals like foxes and rabbits. The foundings of the young ones shows, that sometimes even other useless animals got stucked in the trap. 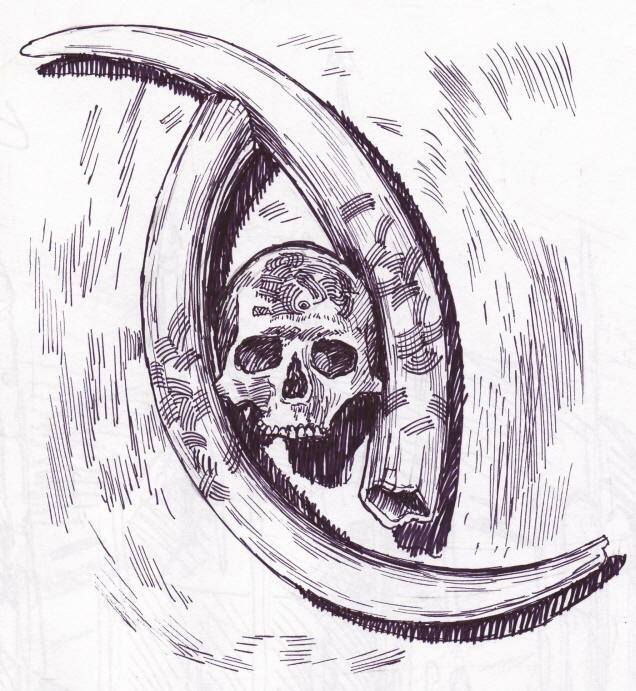 The amount of mamooth bones found on some Pavlovian sites indicate, that mamooths were not only hunted, but also worshiped in a way. 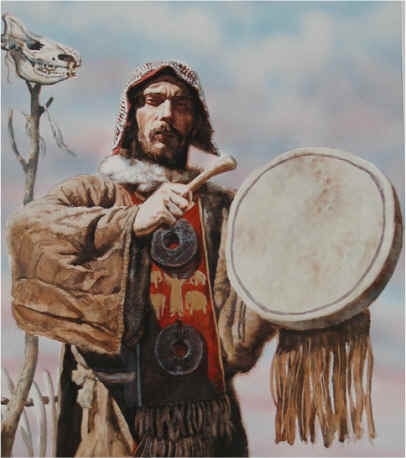 The picture represent a free image of a shaman, which is about to communicate with the spiritual world to influence the moves of the herds. The projectile points made of straightened ivory were not only functional, but even had a magical power. The Pavlovian people were one of the best hunters in the world. Their teeth give evidence that they never starved. They were able to hunt down any animal they needed to – from arctic foxes, hares, and wolves to the largest terrestrial animals of their times. They probably used a wide range of various weapons. Archaeological findings show us many points, from tiny stone points to large ivory ones. There is also evidence of the production of nets, and it is logical to assume that the nets were (besides other usages) utilized for hunting smaller animals. 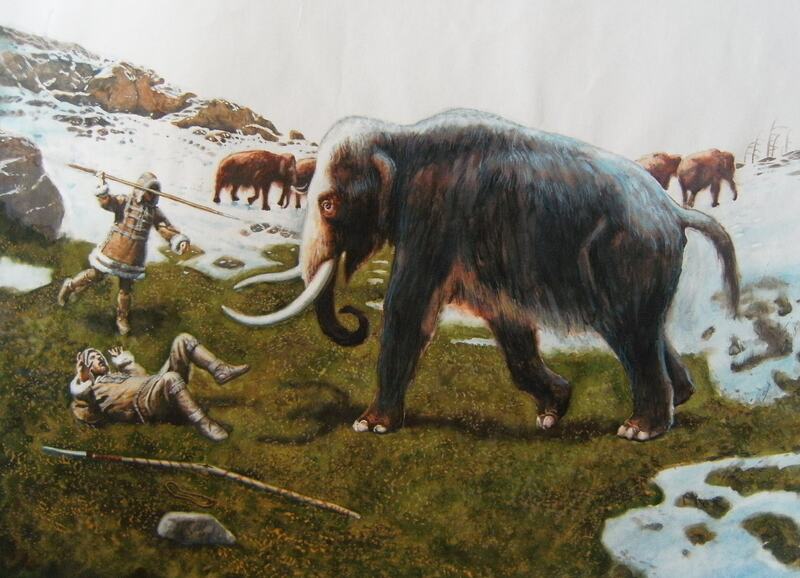 An older conception of mammoth hunting on the slopes of the Pavlov Hills. Hunting of young mammoths was proven, their bones and teeth were unearthed in the Pavlovian sites. Their meat was tenderer than that of adult mammoths, similar to present-day veal. 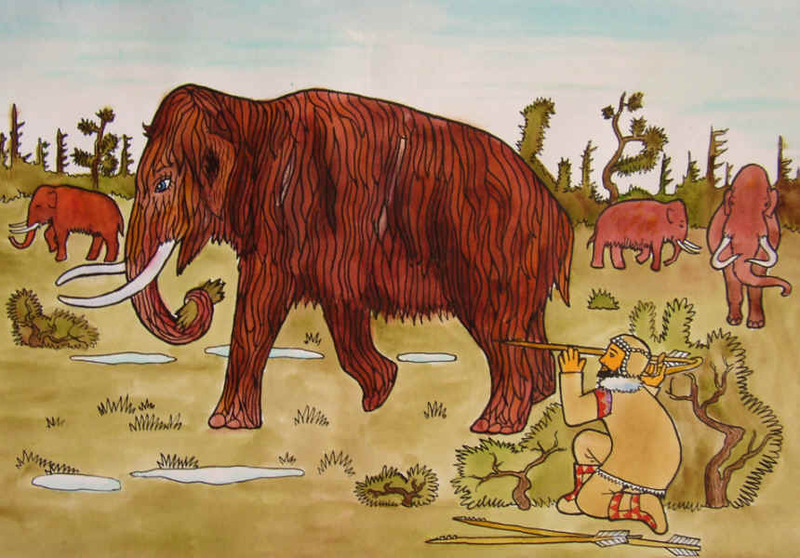 The reconstructional imitation of the mammoth hunting shows an unusual situation, when hunters flaunt themselves during a prestigious occasion. In their common life they did not risk their lives so much. The weapons of the Pavlovian hunters were unique, very efficient and reliable. Long points with round transverse sections pierced the large animal’s body, and because of the effect of leverage, they injured the animal seriously. Other wounds were inflicted by the movement of the hurt animal, and the result of it was almost immediate serious internal injury, which could be compared to that caused by a shock wave made by today’s firearms. Although the struck mammoth had only a small hole in the skin, its internal tissue was badly damaged, the mammoth lost its energy fast and died in a short time. It means that the depicted mammoth is not some invulnerable demon, but a fatally hurt animal that will collapse any moment. 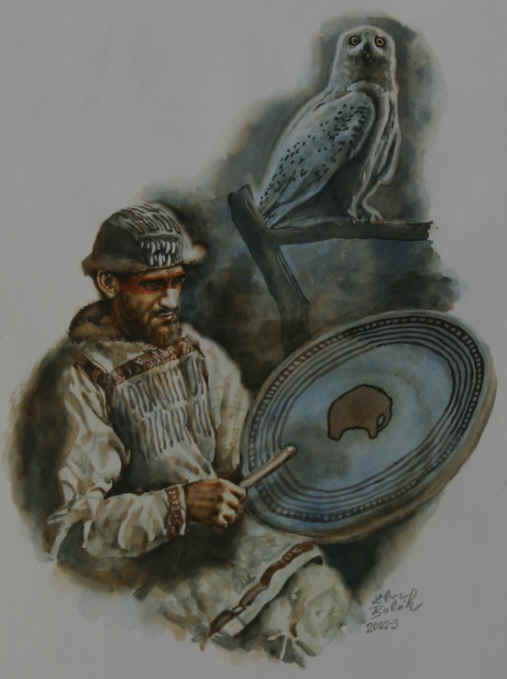 The reconstruction of the mamooth hunting shows the usage of the spear with long projectile points, made of mamooth bones. The hunt could be made even more effective when more men throw the spears at once, like they used to do with Africans elephants. After that, the animal was immediately paralyzed. The portioned meat and big bones were than transported to the settlement. 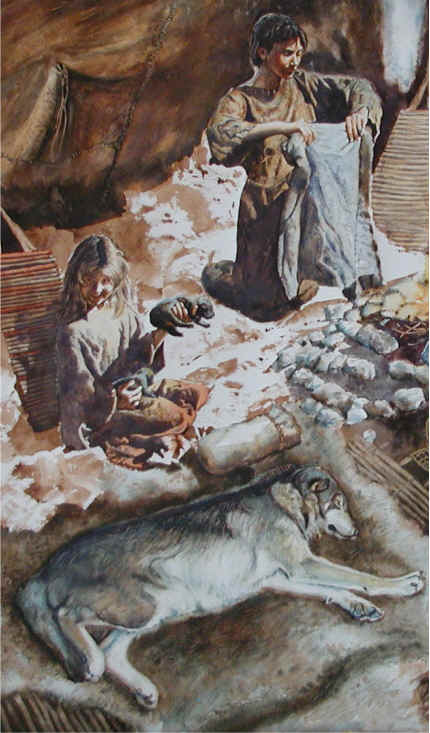 The bones of the hunted animals represented a problem for the hunters. When the living mamooths found the bones of their companions, they avoided the huntinggrounds of the Pavlovians. Therefore, the hunters gathered the bones in their settlements. The largest storing spaces of the mamooth bones are in Předmostí and Dolní Věstonice. Did they represent prestigious trophies? Or rather oblations that ended up in the depressions filled with water around the settlement? The explanation could be pragmatic; the bones were taken for simple raw material and many of them ended up as a fill of the slushy terrain craggedneses. Huge supplies of meat were smoked in the dwelling. 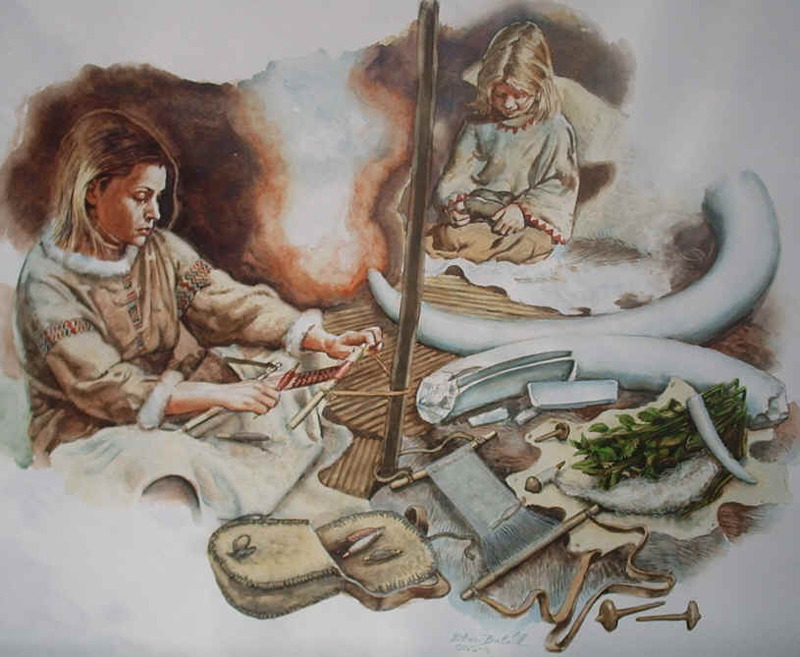 Mammoth bones and probably mammoth fat served as a fuel. The interior of the dwelling was the world in itself, where there were no arctic conditions and it was possible to take off one’s clothes. 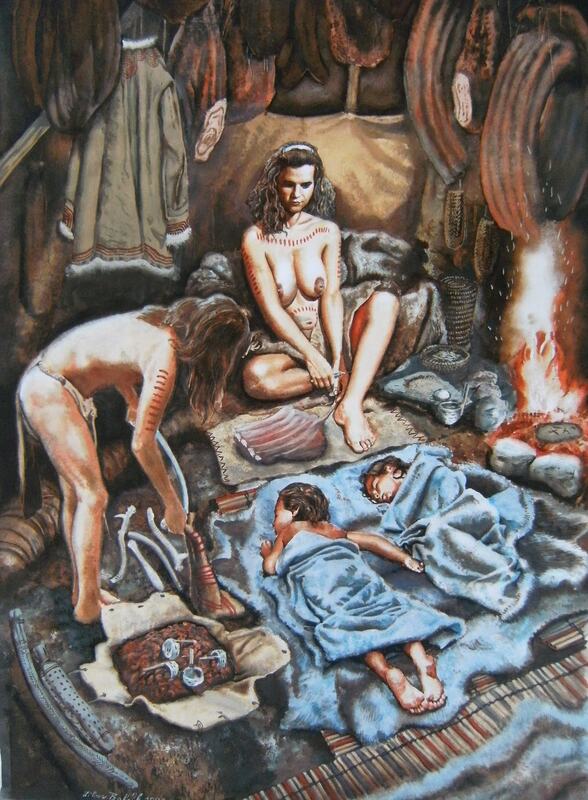 So the Pavlovian people could be practically naked in their dwellings, similarly to the Inuits. The pattern for decoration of the woman on the foregoing picture was this unique human relief found in Dolní Věstonice. The reconstructive transformation offers two explanations; simple body painting or permanent tattoo. The Pavlovian people ate not only meat, but also less abundant plant foods. For example, roots of reeds could be ground by stones and it was possible to prepare gruel or to bake bread using a hearth or just in embers. Inside of this dwelling, we can see the children playing with clay figures. 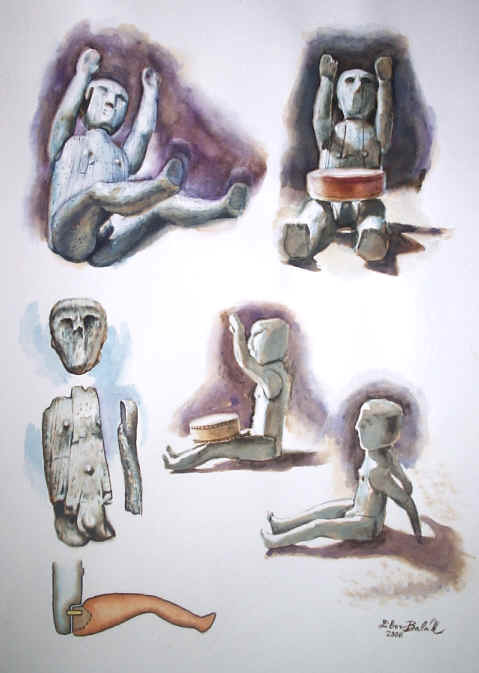 In contrast to the ivory, the potter´s clay enabled the children to be creative. The fingerprint of one of the figurine of Dolní Věstonice illustrates, that the even the children worked with the clay. Domesticated dogs were faithful companions of the Pavlovian people in their work and leisure time, during hunting expeditions, and they could also guard dwellings. People kept similar dogs also in eastern Europe, in Mezin (now the Ukraine). Genetic analyses suggest that the domestication of the dog occurred before the era of the Northern hunters. The rivers had always been of great importance for the Pavlovian people. They used to build their settlements on the riversides. An older image shows collecting and drying of the driftwood, which was used for heating. 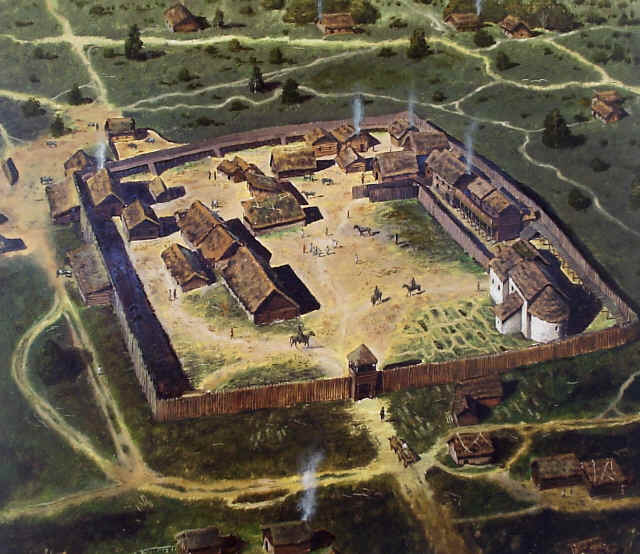 Permanent settlements like Dolní Věstonice could provide excellent strategical view in the countryside; nevertheless, this would have been useless without the ships; the countryside was divided from the settlements by the river Dyje. It was Moravia that yielded the largest collection of bones of the Palaeolithic modern Homo sapiens. Every single burial and bone material of the Gravettian people is extremely scarce and inestimable. The Gravettian people did not practically bury the dead below the ground, although there were many rituals and ways of burying. Mostly disabled people, people with pathological features or peculiar individuals were put into a shallow hole in the frozen ground and covered up with earth. It is possible that some of the burials were in fact secondary burials, when only bones were buried. Such a secondary burial is depicted in the picture above. This is a reconstructional imitation of the burial in Předmostí, where Karel Maška found the remains of 19 Gravettian people under these stones in the nineteenth century. Primary Gravettian burial sites looked probably like this. The dead were put above the ground or on the ground, and only some of the human bones were sometimes put into shallow holes. 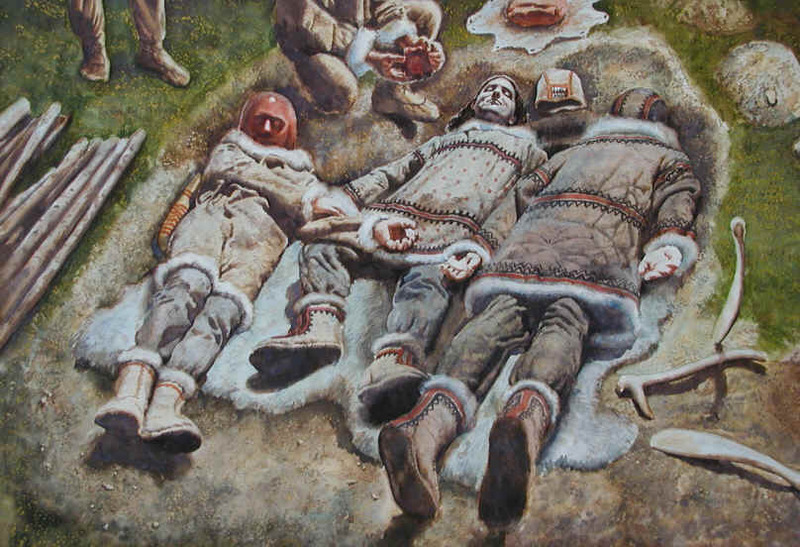 It is important to notice that primarily buried human bodies were mummified in the permafrost and remained practically unchanged for centuries. Unfortunately, there are no large areas containing Palaeolithic burials, and that is why our knowledge of the Palaeolithic is so scarce. This picture depicts one of the exceptional group burials, which was probably carried out according to the then mythology, when buried people were identified with important mythological persons or even heroes. The faces of the dead were covered with thick masks made of red ochre. It is noteworthy that the two persons on the left, perhaps a girl and a young man, are turned in the opposite directions, but their arms are connected. It is the same principle of the unity of polarity as in the Russian sites of Gagarino and Sungir and in Italy. The back of the hand of the third person is placed in the crotch of the individual lying in the middle, which shows that there must have been some relation between them. It is possible that they were relatives, but some mythological explanation seems to be more probable. We can hardly guess the full sense of the gesture without knowledge of the mythology. The triple burial was unearthed near the village of Dolní Věstonice in 1986. The red fraction of a face mask had been discovered in one of the graves in Dolní Věstonice. We don´t know, whether the masks have been dashed on the dead men´s face directly after the death, or after some time. From other funerals, it is known, that the early people manipulated with the humans remains more times. The dead people could be preserved for decades in the cold climate. Hovewer, the bare spots would show the dryed dead human tissue; maybe that was the reason for covering the bare spots with red clay, which in this case was also used on the hands of the men. Some of these artefacts remain a mystery. We still do not know the meaning of cylindrical weights, spoon-shaped things or thin circles remaining us of today´s rings. The manufacturing of these artefacts often started with chopping of a thin slab, and than engraving and rubbing. Man and a woman in a dwelling. 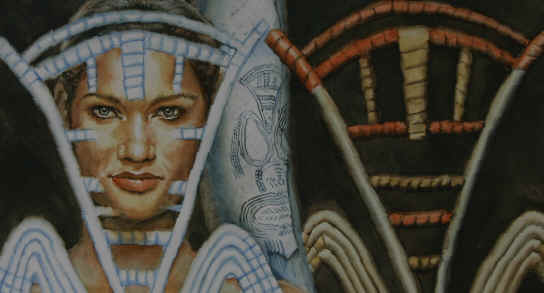 The woman is wearing a ring, double-beads made of mamooth bones stitched on the clothing and small lockets on ears. These lockets were really found in the grave in this locality. The man is manufacturing some artefacts, that we now call mamooth-headbands, but the reall purpose of these subjects stays hidden. 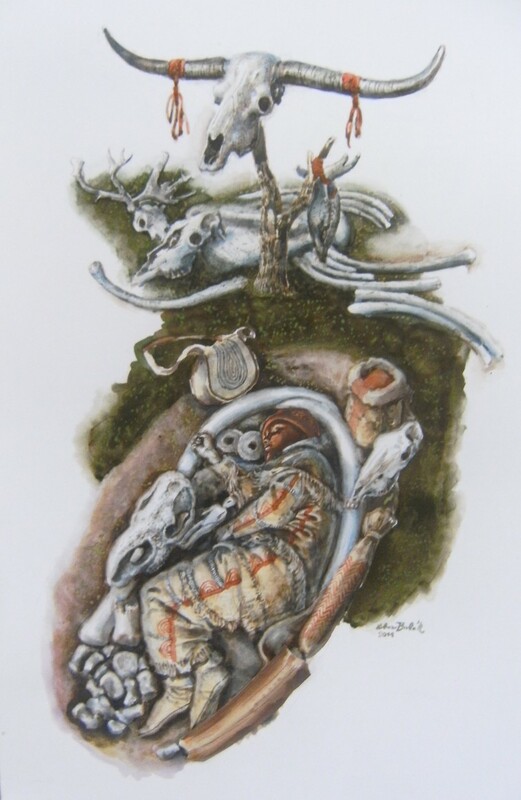 This reconstruction shows the usage of the digging tools made of mamooth ribs and cariboo antlers, found in Pavlov locality. The digging of the holes in Pavlovian was limited by the fact that not deep under the surface was always frozen soil (permafrost). The recent reconstructional imitation depicts weaving on simple personal looms. The advantage of the small looms was that they were portable. The usage of larger looms is also considered a possibility. The spindles are wooden. You can see the whole process, when fibres, yarn and textiles are made successively from the nettles. The textile was probably used for decorative purposes. This reconstruction was on display at the International workshop on the Gravettian in Mikulov in 2002. The scientists noticed unusual regular parallel lines in the fired clay unearthed in the Pavlov Hills sites. 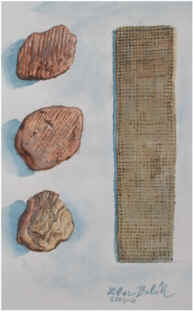 James Adovasio (working together with Olga Soffer), a specialist in prehistoric textiles, who studies Palaeolithic Indian sites in America, was the first to evaluate these lines as textile impressions. He even proved various types of twining and manufacturing of ropes. The Pavlovian sites yielded the oldest proof of the existence of textile in the past of the Homo sapiens. Fibres from nettles were probably utilized, but import of plants giving finer fibres from warmer regions could also be possible. 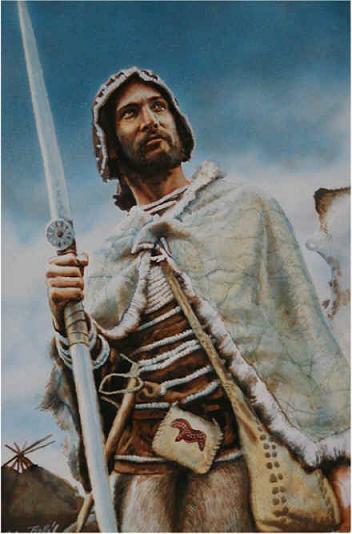 In eastern Europe there exists a calvary unearthed near the Skhodnya River, which also bears a surface structure reminding of an imprint of a coarse textile. The calvary was studied by O.N.Bader, who was also involved in the excavations of the Sungir site. It is still unclear if it is an impression of textile made deliberately by people. Grinding of stones is one of the characteristic Pavovian technologies. It was a unique technology in those times. In Moravia, it was used mostly for adjusting hammerstones. The Venus of Willendorf of Austria was also ground using the technology. 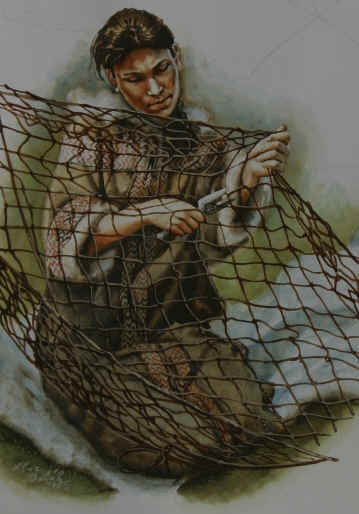 Net hunting is a way of passive efficient hunting. An impression of a small knot of a net in clay was discovered together with other textile impressions from Pavlovian sites. Sewing with an awl and sinew is quite easy, we do not even need a needle. It is enough to wet the part of a sinew, which we want to be flexible, the tip remains dry and hard. Awl –type tools are the most abundant group of bone tools. 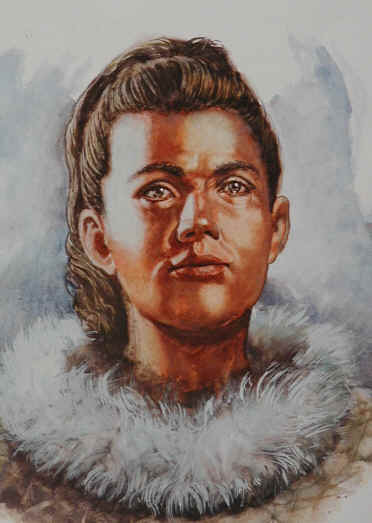 The painting of a woman, resembling the figurine of the Venus of Dolní Věstonice (also called the Black Venus). The painting shows, that the statuettes are mixtures of decorative and geometrical patterns with real anatomical elements. The skew scores on the head indicate the forelock. The body of the woman is lenghthened and does not show the lap, which on the other side is visualized on the ivory statuette. One long horizontal score defines the sexes and separation of the legs. An absolute rarity in Gravettian tradition is the depiction of the collar bones on the Black Venus figurine. These artefacts made of burnt clay are unique. The Black Venus is one of more than 130 today known Gravettian Venuses. The image was created with the help of Ing. Vít Lang. is the Gravettian culture of Moravia, Slovakia, northern Austria, southern Poland and Central Russia following the Pavlovian, approximately 26,500 - 22,500 years old. The typical tool is the Kontenki-type point with a cut. The silicites from the Krakow region and attractively coloured radiolarites from the White Carpathians were distributed throughout the region. Already in the nineteenth century the world-renowned Venus of Willendorf was unearthed by the Danube River. 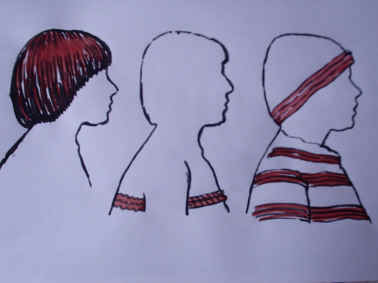 The reconstructional transformation shows various arrangements of the head (different variants of the transformation) typical of that culture, when long hair was rare. The very first reconstruction of the full authentic form of the mammoth statuette, found in West-Slovakian locality Moravany nad Váhom. The founded torso is thanks to the completion of the statuette thinner and longer and shows a clear relationship to the subcultures of the Avdějevo and Kostěnky na Donu localities. The very first reconstruction of the authentic form of the hematite statuette of the Landek – Petřkovice in Ostrava locality. The preserved torso has an unusually slim and female looking shape of sand-glass; but comparing to the gravettian proportional canon, the figure looks like one of the slimmer versions of the East-Kostěnkov style. 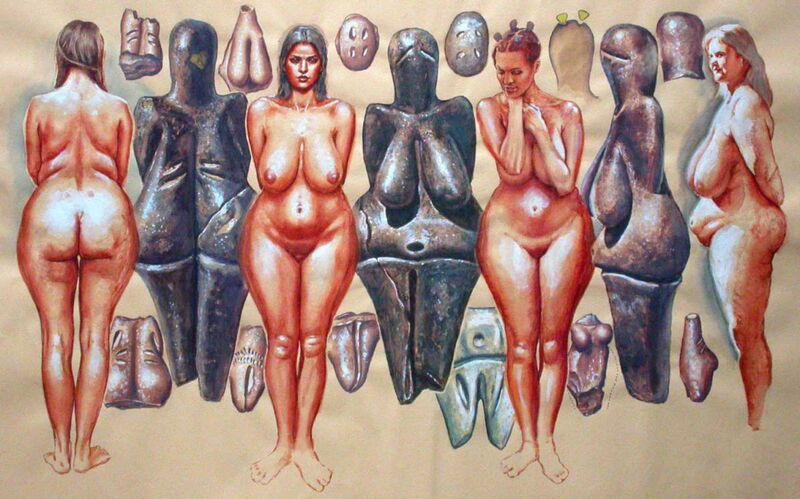 On the left, we can see the Gravettian figurines, on the right is a real woman. The Gravettian figurine is divided into 6 almost equally long parts. The front and the back viewpoint does not correspond – the lap is too low and the femoral bones are too short. The principe of this specific canon lasted at least 15 000 years. Some 28,000 years ago (23,500 RCYBP), a 10-year-old boy began to suffer from an excruciating, even unbearable pain in his hands and legs. He suffered from periostitis, the bone illness. He did not reconcile himself with his fate, learned how to defeat his pain, grew up into a strong man and become a shaman because of his abilities and qualities. He possessed a fascinating cap sewn with some 600 shells (of the Dentalium badense), big stone pectorals, a figurine of a man, many discs made of various materials and several animal skulls. When he died, the survivors broke his drumstick, and one of its parts was placed to his grave together with the other things that he was using. It is possible that they placed the other part on the grave together with the drum. Such a custom is still alive in some Arctic communities. Although the artefacts in the burial remind of those of the Pavlovian and the burial itself was considered to be the oldest one of a shaman, the radiocarbon dating shows that it was more recent and belonged to the Kostenki-Willendorf culture. This unique figurine of a man made of ivory was found in the burial of the shaman of Brno. You can see the level of the craft and the strength of time, which changes everything considerably. Even if you find the figurine on the left ugly, full of cracks and dull, it is possible to say that it is in fact incredibly beautiful and complete. The finder had to glue the small fragments of it together, as it was totally broken up when found in the nineteenth century. The little hole in the bottom part of the statuette could be used for fixing it by the cog. Nevertheless, there is a suspicion that the hole could be made be insects. The older schema of the statuette shows a preserved sculpture made of a mamooth bone. New revision indicates that the hands were placed only slightly in front of the body. The schema shows two possible legs positions - a sitting person and a standing person. The variant of a sitting person with horizontally set legs looks more natural and above all, it explains the breaching of the Gravettian canon, where the botty should be higher than the lap. There must have been an exception made with the sitting person, because by the rearview, the person must have sat on the botty. The sitting statuettes are also known in Gravettian; the nearest locality where they were found is Předmostí, Moravia.Today, we are planning new adequate picture edits. 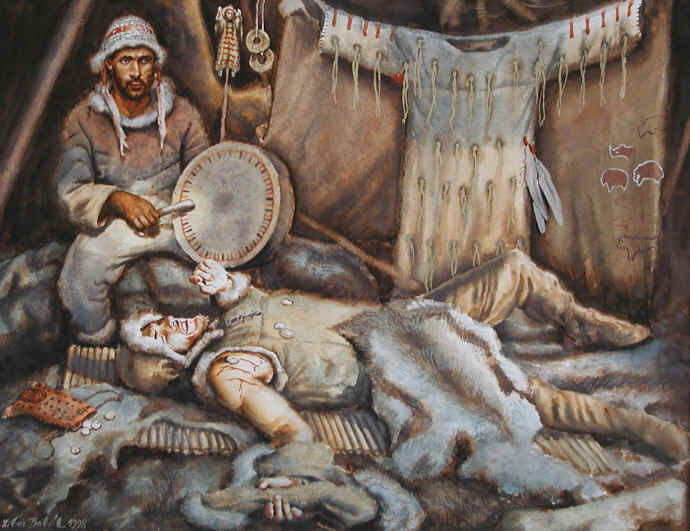 The older reconstructional imitation depicts the dwelling of the shaman of Brno, where he heals a wounded hunter using discs. It is one of possible versions within the “corridor of the possible”. (Some consider the disc pieces a parlour game). The last picture of the Pavlovian culture shows a typical Pavlovian wizard. 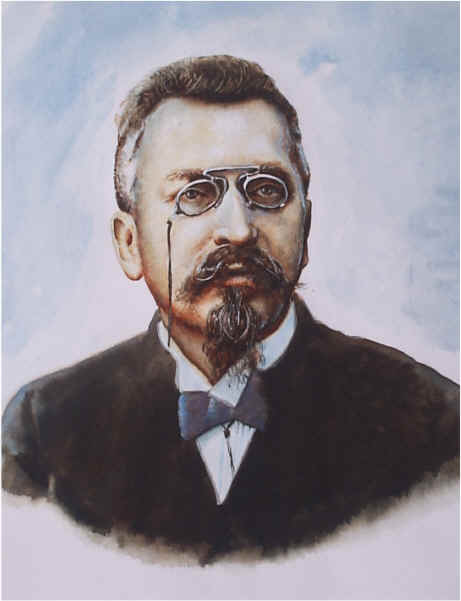 Karel J. Maška was an important Moravian explorer of the second half of the 19th century. He became famous especially for discovering the collective grave in Předmostí u Přerova and long term research of this locality. He publicized the Mamooth hunters era at home and abroad.